Reverse osmosis | Reda s.p.a. 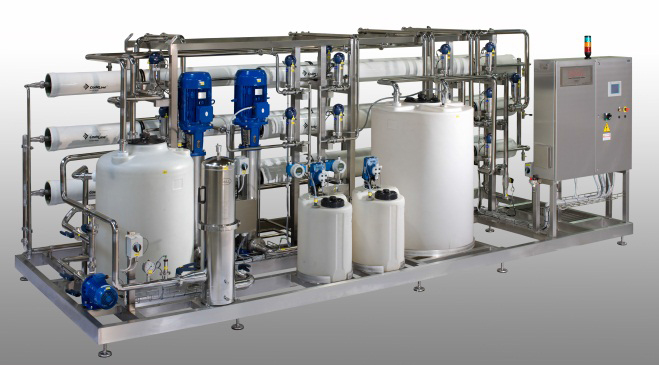 Thanks to decades of experience and continuous collaboration with our customers, we purpose Reverse Osmosis units of water treatment for general industrial use and specifically for the dairy industry. Cleaning waters of product lines, tanks, vats and all equipment being in contact with milk. It comes processed only the first “thrust” from which are recovered either the water (Permeate) and milk concentrated components (Retentate). Dairy whey. After suitable clarification, pasteurization and skimming, whey can be separated in two fractions: a Retentate, containing practically all whey feeding solids and a Permeate (practically water with traces of organics and Salts). Reverse Osmosis can concentrate solids up to a 18-25% and is therefore an excellent pre-treatment before subsequent evaporation and final desiccation, permitting a remarkable economic saving. Concentrated whey can be even carried to a process station, with remarkable economic saving in terms of transport. Milk (whole or skimmed). Milk comes pre-concentrated with Reverse Osmosis up to a final concentration of solids in Retentate of about 30%: this operation can be done as a pre-concentration to an evaporation stage and subsequent desiccation, always to obtain economic advantages in the final phase of pulverisation, being able to process smaller volumes at higher concentrations. 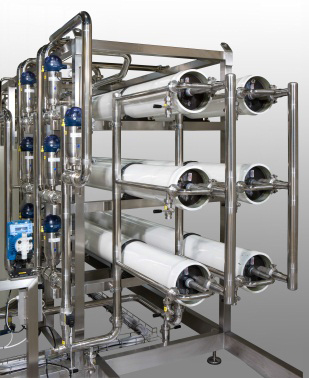 Water recovery (Polishing) of condensates from milk or whey evaporation, permeates of Reverse Osmosis or Whey Nanofiltration, permeates of Ultrafiltration. The recovery may vary from 70% to 97 in case of RO and NF while recovery of UF is maximum 75%. Also in these applications membranes used are of polymeric type with a spiral-wound design.